Lightly oil the mold chosen. Roll out about 5 grams of clay to a 3-card thickness. Press the clay into the mold, ensuring you have pressed the clay into the recesses to capture all of the details. Carefully remove the clay and place on a non-stick work surface. If needed, use the tip of the beading awl to break the seal between the mold and the clay so the clay releases cleanly. 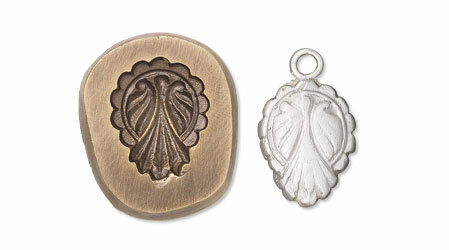 Use a beading awl to clean up the edges, removing the excess clay from around the molded design. 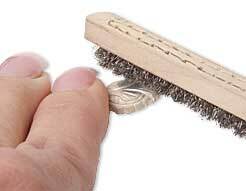 Use a wet paintbrush to clean and smooth the edges. Let the molded design dry. Tip: For deeper molds, use more clay and either roll to a thicker depth or place a "lump" of clay into the mold. For components that will be hung like charms, add an upeye finding, pinback finding, etc. to the clay after removing from the mold so the finding dries in place. Using files and polishing papers, refine the edges of the dried clay component. Fire on a kiln shelf in a kiln or, if the design is smaller than a half-dollar, place onto a fire block and, following firing instructions, fire using a butane torch. Once cooled, brush component to bring up the shine. Optional: For a greater shine, place the component(s) with steel shot and a weak solution of dish soap and water into a tumbler and tumble for 20 minutes. Check the shine and if needed, tumble longer. Rinse with water and soap once complete.